Reproduced with editorial permission from Hay, G.,(1997), Counting Ceramics, Pottery in Australia , (6), 3, 1997, 19 – 21. ​Graham Hay digs through surveys, reports and research papers to find out how many ceramicists and buyers are out there, and why prices are artificially low. This is an attempt to quantify the number of art and craft ceramic producers and their overall market, in the hope that it will provide an opportunity for you to assess your own circumstances. Such self-analysis may be appropriate given the recent decision by the Australian Tax Office to scrutinise artist's 1997 tax returns. The market for ceramics can be separated into the recreational (non-financial) and the professional (financial) markets. This separation is made because ceramics can be either given away or sold. The former market is the millions of personal gifts made for family and friends, or personal expression and exploration, and are not part of the professional market. The latter market is where ceramics are sold and bought. Ceramic objects may move through both markets over the years as they pass from person to person. This article will mostly focus on the professional market. However the ceramics market is not just the selling and buying of ceramic objects, but also the skills used to make them. These skills can be sold separately as a ceramic lesson at a school, community centre, TAFE, university, private institution and studio. Teaching is the largest non-production source of income for professional artists (and ceramicists). 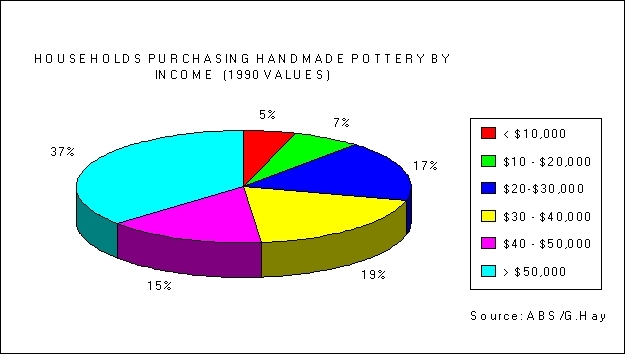 Prosser (1989) and Throsby & Mills (1989) quantified this as contributing a third of crafts people's income. Consider also the skills you have developed in running your business. Skills in designing, manufacturing, selling and shipping are transferable to, and valuable in, managing any business. These skills are the human capital, as opposed to the financial capital, you own. Traditionally, these administration, management and marketing skills have not been a major source of income for ceramicists. However, there may be no reason why these could not be an additional source of income for you. Consider first the supply side of the ceramics market. I define ceramic producers as either professional or recreational ceramicists. Professional ceramicists are production potters and ceramic artists. The size of this community is difficult to estimate: Prosser (1989) calculated that 17% of an estimated 11,300 professional visual artists and crafts people in Australia are professional ceramicists or potters. This calculates out at about 1,921 professional ceramics people. This conclusion was based upon Australia Council grant application records, the National Association of Visual Artists' and Craft Councils' databases and commercial gallery information. As many ceramicists have little contact with these organisations, these estimates can be questioned. (I know the names of over 500 Western Australian (WA) ceramicists, nearly double Prosser's estimate for this state). Prosser estimated that about half of professional ceramicists were producing full time, with the balance working also in other arts and non-arts activities to supplement their income or fulfil their domestic obligations. An Australian Bureau of Statistics (ABS) survey of WA households estimated that 323,346 people were active recreational participants in arts and crafts activities. Since WA contains 10 percent of the national population, this suggests that over 3.2 million Australians participate in recreational visual art and craft activities. If we use Prosser's 17 % ratio of clay to total visual arts and craft, then 544,000 Australians are recreational clay users (3 % of the population). These numbers indicate that professional ceramicists are outnumbered by recreational potters 500 to 1. The significance of this ratio is that many of these recreational ceramicists are potential professional ceramicists. Many do occasionally sell their work, creating a major problem for professional ceramicists. The problem is that recreational ceramicists become semi-professional and discount their work below the real cost of producing the work (they subsidise the cost of production from other income sources). The full cost includes not only clay, glaze and firing, but also depreciation, transport, and the cost of living. The result is that the professional market is flooded with recreational ceramics priced well below the real cost of their production. For as long as it is easy for recreational ceramicists to become semi-professional ceramicists, ceramics prices will always be depressed. Moreover should professional ceramicists appear to be making good profits then thousands of these semi-professional ceramicists could be tempted to sell more of their ceramics and so extinguish these profits. Similarly, during periods of high unemployment the recreational potters sell more work to supplement declining household incomes, undermining professional ceramicists' incomes. Contrast this picture with other professions, such as medicine, law, engineering and accounting, which are all extremely difficult to enter: Potential entrants are required to compete at a very high level before entering and during the compulsory university training. Moreover the number of university places and accreditation for these professions are carefully limited by their professional associations. There have been many economic studies of the financial and quality benefits flowing to these professions because they exercise a degree of self control over their own numbers. Restricting the number of graduates would create one barrier but would also restrict the incomes of those teaching ceramics at TAFE and university. But ceramic teachers' incomes are already declining or depressed as a result of the rationalisation of art schools. In these circumstances ceramic groups should become pro-active, rather than reactive, and lobby for the capping of graduate numbers at their current level. Ceramic group office holders who are educators should be aware that most other professions carefully survey income level cycles and adjust university entrant and immigrant accreditation numbers accordingly. I do not advocate a reduction in recreational ceramics classes, only those creating professional ceramicists. Restricting access is only one of a number of changes available to bring about an increase in professional incomes and standards. To quantify the total demand for ceramics there are two major sources of estimates; population-wide surveys or surveys of buyers and outlets. The latter estimates are less accurate because they cover only the 52 % of sales which are from art/craft or gallery shops, ignoring shops which also sell other products, stalls, markets and direct studio sales (ABS). The recent "To Sell Art, Know Your Audience" (1997) report is biased for this reason, as well as being too focussed on the very top end of the market with little detail on ceramics. In these elite markets the sale values are higher (mean fine craft prices range between $140 - $310) but the costs are much higher and sales are less frequent, often resulting in a lower net profit. 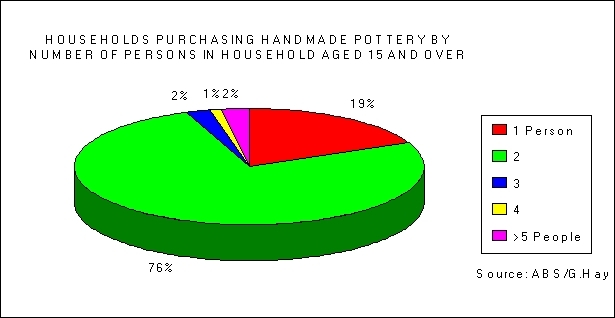 Based upon a very large population survey, the ABS estimated that 61,675 WA households had purchased handmade pottery in the 6 months prior to October 1990. That implies a potential national ceramics market of well over 600,000 households. Note that surveying households rather than individual buyers provides a better indication of disposable income and hence our real market. Similarly, in defining the audience for ceramicists' skills we need to look wider than simply the university and TAFE art schools, to the thousands of adult and community centres across Australia (over 500 in WA alone). Moreover less than 14 % of those participating in ceramic activities are doing it at a college, school, community hall or centre. The vast majority play with clay alone, suggesting a largely untapped market for home-based or ceramicist's studio-based tuition. ​I believe the principal market for ceramicists is the 544,000 recreational ceramicists across Australia (see above). These have developed an appreciation of your skills and work. Those elsewhere involved in the performing and visual arts and crafts are also potential buyers and students for the same reason. Arts industry salary earners not only have an appreciation of your work, they also can afford to buy it! Do not forget performing arts audiences, 63 percent of them have attended an art/craft exhibition in the preceding year (Hides 1995). ​Demand for ceramics has annual, structural and long term cycles. The traditional pre-Christmas peak is part of the annual or seasonal cycle. Macro economic factors, such as total consumer demand (such as the slowly improving current situation, which has been held back by high unemployment) also create long cycles of two to eight years. ​Structural changes in demand for ceramics reflect a shift in purchasing patterns and are more difficult to identify. Individual potters may identify particular types of their work which begin to sell more quickly, however it may simply reflect a group of buyers who have shifted their buying away from another ceramicist. The collection of sales information from a large number of producers over a number of years would enable the aggregate data to be adjusted to remove seasonal and aggregate demand variations, and to identify these structural changes. This information could also be used to regulate the number of graduates from vocation ceramics courses. Australian Bureau of Statistics. (1991). Arts and crafts: Purchasing and participation: Western Australia. October 1990. Hides, D. (1995). Performing arts patrons: A graphical report of 1994 and 1995 generic patrons survey findings. WA Departartment for the Arts. Prosser, G. (1989) Visual & craft artists: A national study of the Australian crafts and visual arts industry. Australia Council. Quadrant Research Services. 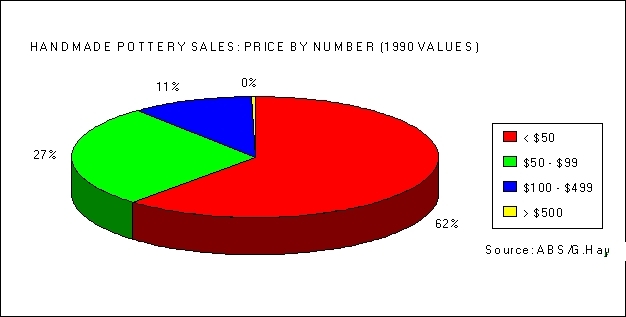 (1997) To sell art, know your market: A survey of visual art and fine craft buyers. Australia Council. Throsby, D., & Mills, D. (1989). When are you going to get a real job? An economic study of Australian artists. Australia Council. Throsby, D., & Thompson, B. (1994). But what do you do for a living? A new economic study of Australian artists. Australia Council.